Last week LEAD proudly hosted two very special events with the extraordinary Vikki Reynolds. Commencing a five-week tour of Australia, these two events were Vikki’s only Sydney appearances. The sold-out workshops reflected the current work Vikki is doing in Vancouver, Canada, and her just-released book “Justice-Doing at the Intersections of Power”. Our lucky participants were able to purchase a pre-release copy of this book and have it personally signed by Vikki. Vikki’s workshops are inspiring, confronting, hopeful, encouraging and challenging- drawing on her vast experience of working internationally with people who are marginalised and suffering. She proactively resists attempts to “render marginalized people invisible” (Reynolds, 2018), and instead seeks to develop relationships of dignity and respect. Her message on centering supervision inside a framework of collective ethics, a culture of critique and a commitment to justice doing, was particularly thought provoking. Much of the rationale behind Vikki’s approaches to supervision are transferable to business leadership and management, bringing a very different lense to the more traditional leadership models. 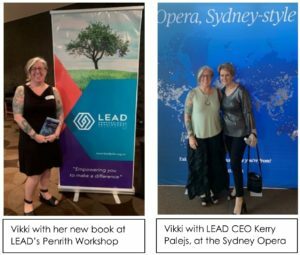 If you missed out on seeing Vikki last week don’t despair, LEAD is very pleased to announce that we have secured time on her next trip down under in November next year!